Travel and community will merge in Spring 2020, thanks to a passionate, young group of local entrepreneurs. 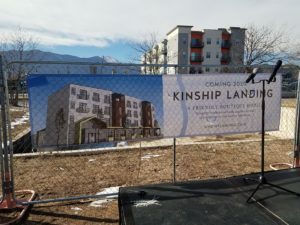 The next exciting addition to the downtown Colorado Springs skyline on Nevada Avenue is officially underway after the groundbreaking ceremony on January 30, 2019. Kinship Landing is a friendly boutique hotel, focused on outdoor adventure, city exploration and connecting travelers and locals alike. meeting space, food and bar options, and concierge. Plus, the most important part of real estate: location, location, location! The build site is located at 421 South Nevada in downtown Colorado Springs (where the old Schooners Restaurant used to be) next to plenty of activities and social options. Located directly across from Loyal Coffee and The Bench Restaurant, travelers will easily be able to enjoy and explore the charm of Colorado Springs downtown within steps of the front door. Being in the core of downtown, if guests don’t feel like walking, there is easy access to options like PikeRide Bike Share, and Uber, Lyft and zTrip ride services. If you have a chance to meet the founders (a group of local millennials including Bobby Mikulas and Brooke Mikulas, and business partners Nate Grimm and Jason Phillips), you’ll quickly see the passion and vision for the Kinship Landing project. After traveling the world and experiencing hospitality, generosity and goodness from others, they wanted to provide these same elements all while helping to develop and promote Colorado Springs. 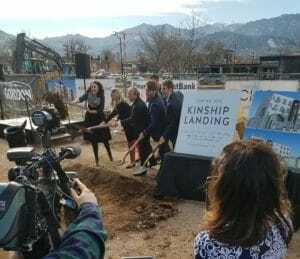 The groundbreaking ceremony included many downtown supporters and locals like Colorado Springs Mayor John Suthers, CEO of Downtown Partnership Susan Edmondson, and CS Indy CEO John Weiss. Plus, proud friends and investors who are helping launch the project. Travelers coming to Colorado Springs have plenty of options of places to stay, including AirBnB’s, VRBO’s, and multiple hotels throughout the city. But currently the downtown area is limited in total rooms available for those visiting Colorado Springs, with really only two main hotels in the core of downtown (Antlers and Mining Exchange). With Kinship Landing opening in Spring 2020 and additional hotels being built, the downtown businesses will start to see more activity and revenue from out-of-town leisure guest and business travelers. 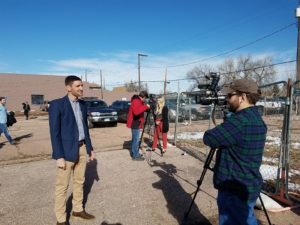 It’s another exciting development for the Downtown Colorado Springs area, as it continues to build momentum and attract more young professionals, entrepreneurs and millennials. It’s no wonder why Colorado Springs was voted best place to live in 2018!